As per DST changes in England, broadcast of live parwachan by Baba Daljit Singh Ji (Preet Nagar, Amritsar) from Bakhshish Dham, Jalandhar will start at 13:30 till 14:30 Indian Standard Time on Thursdays from Sunday, October 28, 2012 onwards. Please manage your schedules accordingly. As per DST changes in England, Live parwachan of Baba Daljit Singh Ji (Preet Nagar, Amritsar) from Bakhshish Dham, Jalandhar will be broadcasted between 12:30 to 13:30 Indian Standard Time on Thursdays from 29th March 2012 onwards. Weyakheya of ‘Babaaniya Kahaaniya’ by Baba Daljit Singh Ji (Preet Nagar, Amritsar). 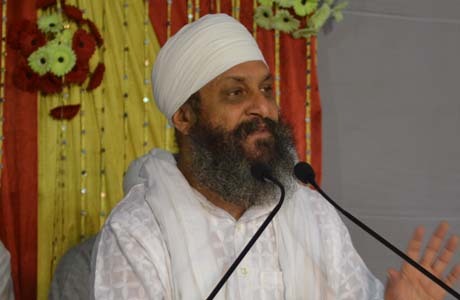 Now preachings of Baba Daljit Singh Ji (Preet Nagar, Amritsar) will also be played live (deferred) on Sanjhi Awaz Radio, England on Mondays and Fridays between 7:00 AM to 8:00 AM (London Time – GMT 0.0). To listen live, please visit SanjhiAwazRadio.co.uk. Or tune your DAB digital radios to SanjhiAwazRadio in West Midland, England. Keep yourself updated on Bakhshish Dham events, follow us on twitter. from 3rd November 2011 onwards. Listen to Baba Daljit Singh Ji’s preaching live from Jalandhar (Pb. ), INDIA.